I thought he was good on defense when I watched the game live last night but he was really really good on defense after watching the tape. Very encouraging steps forward so far. Only complaint is that we need more boards from him considering the weaknesses of this team. He's capable of more than 4 in 28 minutes. No one will ever confuse me for SoCalDevin, but Ingram's defense to start this preseason and season makes me more excIted about him than I've been since the draft. It's not like I'm overly optimistic.. Just so we're clear I don't make statements about him being an allstar, superstar, or the next KD.. I merely defend him when I believe there is a critique that's off. I even said he probably won't look like an allstar for another 2 years. Respect on a chill Friday night. Did you like his 3pt shooting against Portland? What was there to like about his 3 point shooting? This is what I mean, why would I defend his shooting when it was poor? Because he took smart shots mostly in rhythm. Even though he missed all of them, the shot selection was a good sign for the rest of his season. You asked if I liked his 3 point shooting, not the shot selection. Two entirely different things. The answer is still no, I didn't like his shot selection for the most part. Not a fan of iso pull ups for contested mid range J's. The British are so hard to please. I think as fans we forget he just turned 21. If 16pts/4rebs/2stls/2blks in a road game opener is a terrible game for him there there are more reasons to be optimistic about his trajectory as a player than not. Tatum is a special talent. Should’ve drafted him that will surely end up as a mistake. IMO if anyones going to be compared to Durant it should be him. Especially with the way he’s continued growing, that kid might be 6’10” now. You mean Horford? In that pic Horford looks slighty taller. In others Tatum looks taller or same height. Am I still seeing what I want to see? This is a pretty good straight angle and Tatum appears to be the same height as Horford if not slightly taller. I’m assuming he’s laughing at your altered version of his picture. "Respect on a chill Friday night." lol@ BVH trying to use Jedi mind control on me.. This is not the internet fight you're looking for. You clearly have a bad read on me.. wasn't looking for a fight smh. You probably thought I'd be offended by your statement, which is why you said what I quoted. I just thought it was funny. In addition you mentioned my name unnecessarily, which didn't bother me.. but you can't think I'm looking for a fight when you evoked my name in something that had nothing to do with me. I didn’t alter anything, this is a press photo. I'm just an Alec Guinness fan. yes I did not list any stat he did reasonably well so as not to spoil the good vibes. Tatum isn’t honestly all that, not sure why we should feel bad that we did not draft him, it’s not a Michael Jordan and Sam Bowie situation, Tatum will be a legit all star and that’s it. I saw the full stat line and it was pretty bad. Did Kawhi do his thing on Tatum or what? I'm actually not in a bad mood at all.. I just think BVH may have misread me. I was being lighthearted with the Jedi mind control remark. Here’s more proof. Since the other was comical to you. Again, am I seeing what I want to see? You should check out The Lavender Hill Mob if you like old flicks at all. I don't believe BVH was serious. I think he was quoting a line from Alex Guinness. We all need to increase our profound wisdom so we can truly appreciate all BVH shares with us. What I've learned from watching the last four seasons of tanking/rebuilding basketball is to be humble in the face of youth, because none of us really know where these young guys are going. 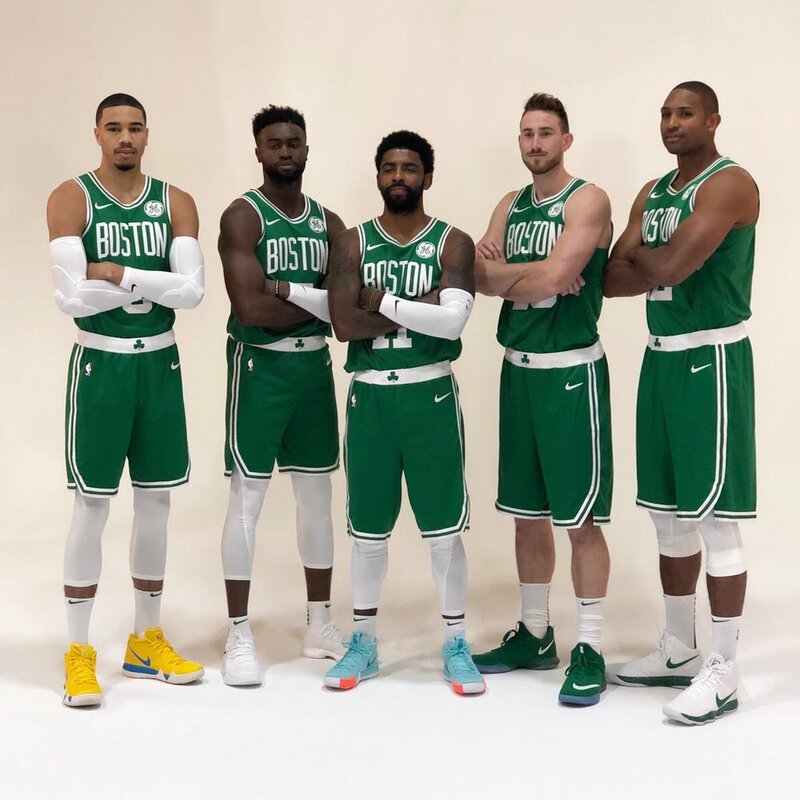 If you notice Horford is standing at least a foot back from Tatum. This will always distort height comparisons. Yep, I study film.. Thx I'll check it out. Yea I realized that after the fact.. I guess he's probably as old as me. Very cool Any particular time period or school you prefer? I honestly don't like Boston and you can include the Patriots. Did not believe you were in a bad mood or BVH.